Having succeeded at getting a basic I2C master working on the STM8S it is not time to start to look at I2C slave devices on the STM8S. The project will be a simple one, the STM8S will take a stream of bytes and perform simple addition. When requested, the STM8S will return the total as a 16-bit integer. Each new write request will clear the current total and start the whole process again. Simple enough so let’s get started. This post is a fairly long as it contains a lot of code so it might be a good time to grab a beer and settle down. Upon receiving a valid start condition and address for a write operation the device will clear the current total. Bytes written to the device will be summed and a running total kept. A start condition with a valid address for a read operation will return the current total as a 16-bit integer, MSB first. A Netduino 3 will be used as the I2C bus master device. This runs the .NET Microframework and has an implementation of the I2C protocol built into the framework. This gives a good reference point for the master device i.e. someone else has debugged that so we can assume that the device is working as per the protocol specification. As mentioned in the previous article on I2C Master devices, there is a really good article about the I2C protocol on Wikipedia. If you want more information about the protocol then I suggest you head over there. //  Create a new I2C object on address 0x50 with the clock running at 50 KHz. 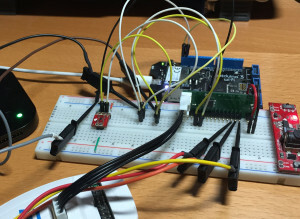 //  Create a transaction to write two bytes of data to the I2C bus. The above application creates a new instance of the I2CDevice with a device address of )x50 and a clock frequency of 50 KHz. A single transaction is created and the master writes the same two bytes to the I2C bus every second. The initialisation method sets up the I2C peripheral on the STM8S and enters the waiting state, waiting for the master to put data onto the I2C bus. The ISR will deal with the actual data processing and in a full application it will also deal with any error conditions that may arise. The peripheral needs to know the current master clock frequency, the I2C mode (Standard or Fast) and the clock divider values. These must all be configured whilst the peripheral is disabled. 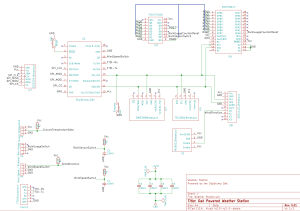 I2C_FREQR = 16;                     //  Set the internal clock frequency (MHz). I2C_CCRH_F_S = 0;                   //  I2C running is standard mode. I2C_CCRL = 0xa0;                    //  SCL clock speed is 50 KHz. The device assumes that we will be using the standard 16 MHz clock speed which has been used in the other tutorials in this series. This is indicated by the I2C_FREQR register. The values for the clock control register (I2C_CCRL and I2C_CCRH_CCR were simply taken from the STM8S programming reference manual. There is no coincidence that a bus speed of 50 KHz was chose, it is simply one of the reference values in the table. No point in creating work if you do not have to. If you want different speeds then you can either use one of the defined values in the remainder of the table or use the formulae provided. I2C_OARH_ADDMODE = 0;               //  7 bit address mode. I2C_OARH_ADD = 0;                   //  Set this device address to be 0x50. I2C_OARH_ADDCONF = 1;               //  Docs say this must always be 1. I2C_ITR_ITBUFEN = 1;                //  Buffer interrupt enabled. 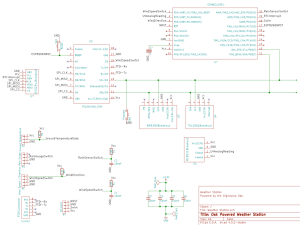 I2C_ITR_ITEVTEN = 1;                //  Event interrupt enabled. 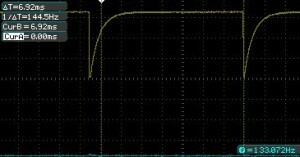 At this point the I2C peripheral should be listening to the I2C bus for a start condition and the address 0x50. The ISR contains the code which processes the data and error conditions for the I2C peripheral. All of the I2C events share the same ISR and the ISR will need to interrogate the status registers in order to determine the exact reason for the interrupt. There are several other vector names we could have chosen, they all contain the same value and the value I2C_RXNE_vector was chosen arbitrarily. This initial simple implementation can use these two events to clear the total when a new Start condition is received and add the current byte to the total when data is received. //  In master mode, the address has been sent to the slave. //  Clear the status registers and wait for some data from the salve. _total = 0;                 // New addition so clear the total. I2C_SR1_ADDR should be set when an address is detected on the bus which matches the address currently in the address registers. As a starter application the code can simply assume that any address is going to be a write condition. The code can clear the totals and get ready to receive data. Note that this will be expanded later to take into consideration the fact that the master can perform both read and write operations. //  Received a new byte of data so add to the running total. This will of course require suitable definitions and support methods. //  to the master when the device is read. //  Define some pins to output diagnostic data. //  Somewhere to hold the sum. //  Bit bang data on the diagnostic pins. //  Set up the system clock to run at 16MHz using the internal oscillator. //  Initialise the I2C system. I2C_CR1_PE = 0;                     //  Disable I2C before configuration starts. //  Set up the clock information. //  Set the address of this device. //  Set up the bus characteristics. //  Turn on the interrupts. //  Configuration complete so turn the peripheral on. //  Acknowledge each byte with an ACK signal. 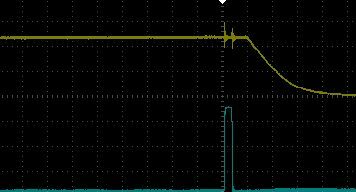 //  I2C interrupts all share the same handler. //  the error, output the status registers and continue. PD_DDR_DDR4 = 1;        //  Port D, bit 4 is output. PD_CR1_C14 = 1;         //  Pin is set to Push-Pull mode. PD_CR2_C24 = 1;         //  Pin can run up to 10 MHz. PD_DDR_DDR5 = 1;        //  Port D, bit 5 is output. PD_CR1_C15 = 1;         //  Pin is set to Push-Pull mode. PD_CR2_C25 = 1;         //  Pin can run up to 10 MHz. PD_DDR_DDR6 = 1;        //  Port D, bit 6 is output. PD_CR1_C16 = 1;         //  Pin is set to Push-Pull mode. PD_CR2_C26 = 1;         //  Pin can run up to 10 MHz. At this stage a quick test with the two devices connected and the logic analyser will show the master device outputting data to the I2C bus. The correct operation of the I2C salve device can be verified by setting break points with in the two if statements in the ISR. Note that this will generate some errors but it is good enough to verify that the ISRs are being triggered correctly. The above shows the output from the Saleae Logic Analyser when the write transaction is sent to the bus by the Netduino. At this point the above code should be accepting data from the Netduino 3. It is now time to expand the code to take into account the requirement to read back data from the slave device. The Netduino code will need to be modified to generate both a write transaction to send data to the I2C slave device and a read transaction to retrieve the results from the calculation. The transaction array has been expanded to contain a second transaction to read the data from the device. The data to be summed has also been expanded to include a further eight elements. A state machine will be used to allow the STM8S to work out what action should be taken within the ISR. This is required as the i”c peripheral will generate an event for the address detection for both the write transaction and the read transaction. The application will need to be able to differentiate between the two conditions as one requires the total to be cleared, the other requires that the total is sent back to the master device. ISWaiting,                    //  Waiting for comms to start. ISAdding,                     //  Adding bytes of data. ISSendingMSB,                 //  Sending MSB of total. ISSendingLSB                  //  Sending LSB of total. //  Slave address received, work out if to expect a read or a write. _total = 0;             // New addition so clear the total. The code above works out if the application is waiting for the first write condition (IsWaiting) or if the address detection has been triggered by a read condition (any other state). //  Receiving data from the master so we must be adding. The master is asking for two bytes and the application needs to track if we are transmitting the most significant byte (MSB) or least significant byte (LSB). I2C_SR2_AF = 0;             //  End of slave transmission. 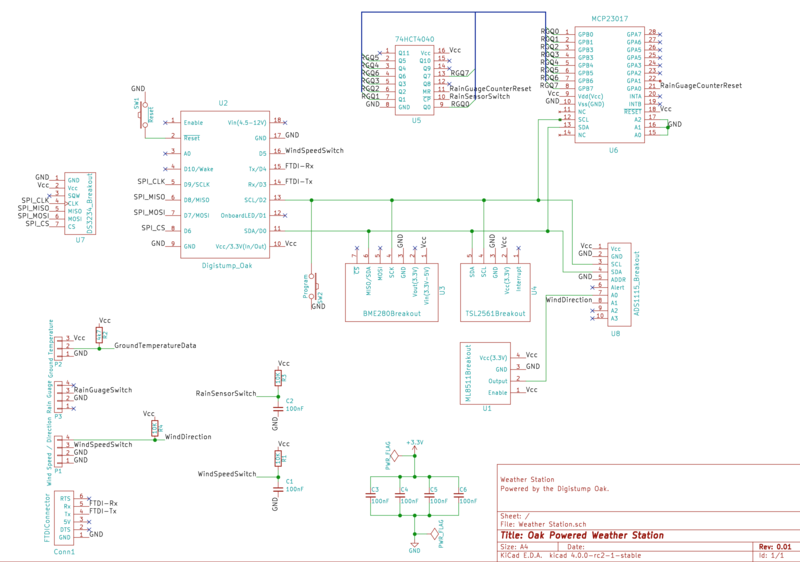 //  State machine for the I2C communications. //  Set up Port D GPIO for diagnostics. //  Set the acknowledge to be ACK. The I2C protocol allows for one or more devices with different slave addresses to be connected to the same I2C bus. The previous article used the TMP102 temperature sensor with slave address 0x48 and this article has created a slave device with address 0x50. It should therefore be possible to connect the two devices to the same bus and talk to each selectively. As with the previous examples, the Netduino 3 will be used as the I2C bus master. The applicaiton above will need to be merged with the code in the previous article. //  Create a new I2C object and the configurations for the STM8S and the TMP102. //  Create a transaction to write several bytes of data to the I2C bus. //  Create a transaction to read two bytes of data from the TMP102 sensor. //  Read data from the I2C bus. //  Convert the reading into Centigrade and Fahrenheit. //  Display the readings in the debug window and pause before repeating. //  Now display the results of the addition. The above code creates two I2C configuration object, one for the TMP102 and one for the STM8S device. The I2C bus object has the configuration changed depending upon which device is required. The write operation to the far left (W0x50) sends the 10 bytes to the STM8S device. This is followed by a read (R0x50) of two bytes from the same device, this can be seen about two thirds of the way from the left-hand side of the trace. The final operation is the read of the current temperature, R0x48, to the right of the trace. to name but a few. The code above should allow for simple devices to be put together is a short space of time. I have finally managed to dig out the TMP102 temperature sensor from the back of the electronic breakout board cupboard. Why am I interested in this sensor, well it is about the only I2C device I actually own and I2C is one of the few areas I have not really looked at on the STM8S. This article will explore the basics of creating a I2C master device using the STM8S as the bus master and the TMP102 as the slave device. The Wikipedia article contains a good description of the protocol and the various modes and the bus characteristics. For the purposes of this post the STM8S will need to be in master mode as it will be controlling the communication flow with the temperature sensor which is essentially a dumb device. This should result in the breakout having an I2C address of 0x48. The Netduino 3 runs the .NET Microframework (NETMF). This has built in class for communicating over I2C. A simple application will give a reference point for how the protocol should work. //  running at 50 KHz. Read the bytes from the slave device. Send an ACK signal for all bytes except the last one. I2C_CR1_PE = 0;                     //  Diable I2C before configuration starts. //  Setup the clock information. //  Setup the bus characteristics. Some of the initialisation for the I2C bus needs to be performed whilst the peripheral is disabled, notably the setup of the clock speed. The method above diables the I2C bus, sets up the clock and addressing mode, turns on the interrupts for the peripheral and then enables the I2C bus. Finally, the method sets up the system to transmit ACKs following data reception and then sends the Start bit. The communication with the slave device is handled by an Interrupt Service Routine (ISR). The initialisation method above will have taken control of the bus and set the start condition. An interrupt will be generated once the start condition has been set. The master then needs to send the 7-bit address followed by a 1 to indicate the intention to read data from the bus. These two are normally combined into a single byte, the top 7-bits containing the device address and the lower bit indicating the mode (read – 1 or write – 0). //  are talking to. Reading SR1 clears the start condition. //  Send the slave address and the read bit. //  Clear the address registers. This above code checks the status registers to see if the interrupt has been generated because of a start condition. If it has then the STM8S is setup to send the address of the TMP102 along with the read bit. At this point the address has been sent successfully and the I2C peripheral should be ready to start to receive data. The I2C protocol requires that the data bytes are acknowledged by the master device with an ACK signal. All except for the last data byte, this must be acknowledged with a NAK signal. The I2C_CR2_ACK bit determines if an ACK or NAK is sent following each byte. The master device can then continue to hold control of the bus or it can send a STOP signal indicating that the flow of communication has ended. These two conditions are dealt with by resetting the I2C_CR2_ACK bit and setting the I2C_CR2_STOP bit. //  will read the temperature from a TMP102 I2C sensor. //  I2C device related constants. 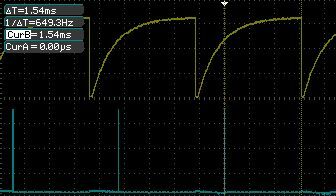 //  Buffer to hold the I2C data. //  the error and continue. The output looks similar to that from the Netduino application above. Breaking out the calculator and using the readings in the above screen shot gives a temperature of 19.6 C which is right according to the thermometer in the room. 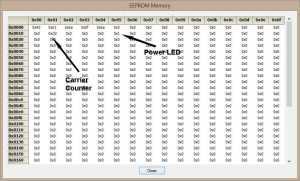 The above application shows the basics of a master I2C application. The code needs to be expanded to add some error handling to detect some of the errors that can occur (bus busy, acknowledge failures etc.) but the basics are there. A few nights ago I was working on implementing the processing the command sequences stored in the STM8S into IR pulses. The Win32 configuration application takes a series of high / low transitions measured in microseconds and turns the infra-red LED on and off accordingly. Doing this would require a signal capable of being triggered to the nearest microsecond. This is where the plot fell apart. Looking at the application now I think it is a case of over engineering the problem. By modifying the design parameters to be more realistic the problem can be overcome. How Fast Do We Need To Be? Previous articles have shown how a 2-3 MHz pulse can be generated by setting the system clock to 16MHz and toggling a port in a while loop. It has also been shown how Timer 2 can be used to generate a square wave using an interrupt based upon the clock pulse. The challenge is to generate and interrupt at a high enough frequency. From the start it was recognised that the generation of a 1 MHz signal was ambitious using interrupts. Raising an interrupt on the STM8S takes 9 clock cycles and working on a 16MHz clock this only leaves 5 clock cycles for the work of the Interrupt SubRoutine (ISR) before the microcontroller returns to sleep and the whole cycle restarts. So the question becomes, is this a problem? Breaking out the calculator reveals that a 38KHz signal (a common frequency used for infra-red signals) has a period of 26 microseconds. So if we were to send a single pulse the ISR would have to respond within 26 microseconds. Having a carrier signal would not make sense if there were less than two carrier signal pulses within the infra-red signal. This would result in a minimum frequency of 19KHz which is well within the capabilities of the STM8S. 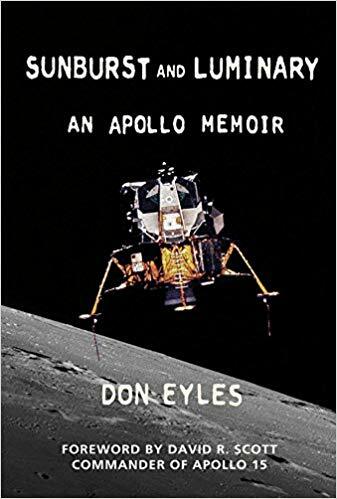 As I said, over engineering, or more likely, worrying about a problem which does not really exist. The changes which have been made are all aimed at making the remote control a universal remote control. It is i=now time to get back to the orignal aims of the project, namely to be able to trigger a Nikon camera. The last post demonstrated the ability to create a configurable sequences of pulses / pauses and store these in the EEPROM. The next step is to convert these into a pulse sequence based upon a 38KHz carrier signal. value is the desired frequency in Hz. The code cycles through the possible prescalar values until the right combination of counter and prescalar vales are obtained. The prescalar for Timer 1 is a value between 0 and 65535. One thing to note is that the value of the counter and the prescalar may not always return an exact frequency, for example, a carrier signal of 38KHz results in counter and prescalar values which generate a 38,004Hz signal. Not exact but given that the remote is using the internal oscillator we cannot expect an exact output anyway. The perfectionist in me finds this to be disturbing but it is something I’ll have to live with. 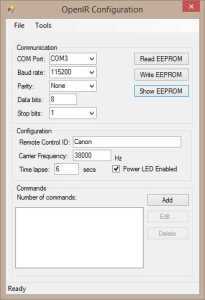 Back on the remote control the application needs to use the configuration information in the EEPROM in order to regenerate the carrier signal for the remote control. //  Set up Timer 1, channel 4 to output a PWM signal (the carrier signal). //  Now configure Timer 1, channel 4. 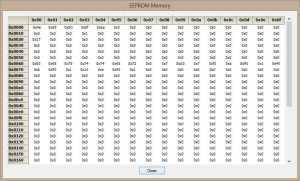 TIM1_CCMR4_OC4M = 7;    //  Set up to use PWM mode 2. TIM1_CCER2_CC4E = 1;    //  Output is enabled. TIM1_CCER2_CC4P = 0;    //  Active is defined as high. //  Work out the 50% duty cycle based upon the count. TIM1_BKR_MOE = 0;       //  Disable the main output. TIM1_CR1_CEN = 1;       //  Enable the timer. 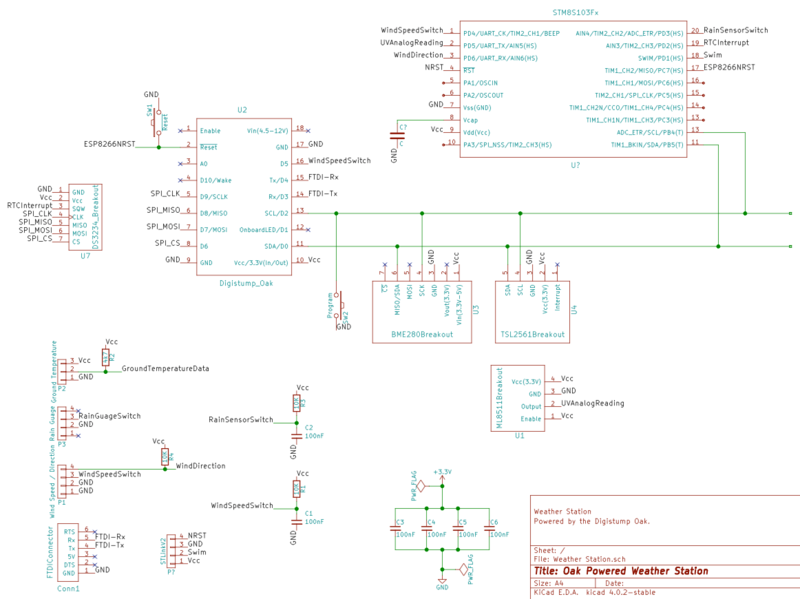 Much of this code uses the counter values from the EEPROM to set up the PWM on Timer 1 Channel 4. 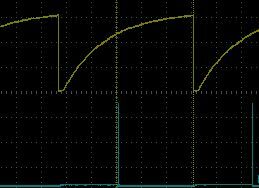 The AND gate takes the PWM signal from the STM8S along with an output enable signal (Port D, pin 3) from the STM8S. Changing the code to disable the timer removes the need for the output enable signal. The timer output is set to active high and when the timer is disabled the output pin of the timer goes into a high state. This problem is resolved by leaving the timer active and disabling the main output of the timer. 0x00 0x10 Name of the remote control. 0x10 0x02 Timer 1 counter value for the carrier signal. 0x12 0x02 Timer 1 prescalar for the carrier signal. 0x14 0x01 Number of pulse sequences / commands in the EEPROM. 0x20 0x40 Length of the sequences / commands in the sequence table. 0x60 0x1f8 Sequence / command data. 0x00 0x08 Name of the command. 0x08 1 Number of pulses / pauses in the command (n). 0x09 n * 2 Command / pause duration in microseconds. Now let’s look at how this data can be retrieved and used. //  Setup Timer 2 ready to process the pulse data. //  We have processed the pulse data so stop now. TIM1_BKR_MOE = !TIM1_BKR_MOE;       //  Toggle the T1 output. //  Reset the interrupt otherwise it will fire again straight away. Where _pulseDataAddress points to the next pulse to be processed and _numberOfPulses holds the count of the number of pulses in this sequence. The code below walks through the list of commands looking for the pulse data for the sequence number held in the command variable. //  We have enough command data. Now work out where the command is. 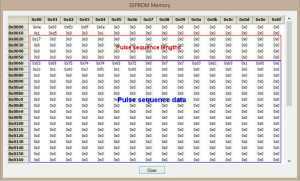 Now we have the pulse sequence is is necessary to set up Timer 2 and the global variables pointing to the pulse data and the number of pulses. //  Now start processing the pulse data for the specified command. _pulseDataAddress += MAX_PULSE_NAME_LENGTH;     //  Skip the name. //  reload and enable Timers 1 &amp; 2. 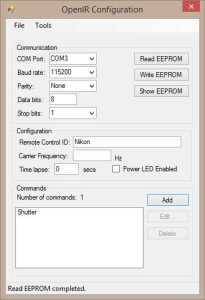 OpenIR has reached the point where command sequences can be edited and stored in the EEPROM and a single command sequence can be transmitted on a configurable carrier frequency. The pulse sequence storage in the Windows application still needs to be tidied up. 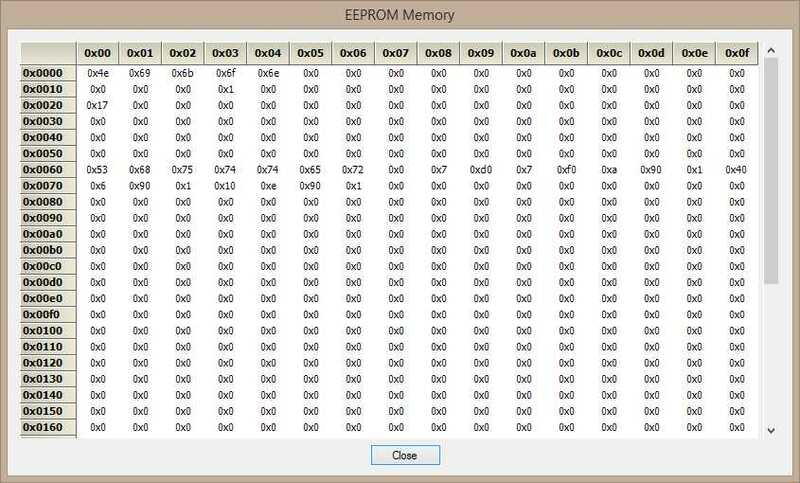 When loading the EEPROM data the Windows application needs to regenerate the data for the list box containing the list of sequences. Add commands to send a determined sequence / command number. Redesign the board to remove the AND gate from the LED output. Once the above has been completed additional connectivity options can be investigated. For those who are interested, the source code for STM8S running the remote control is available for download. 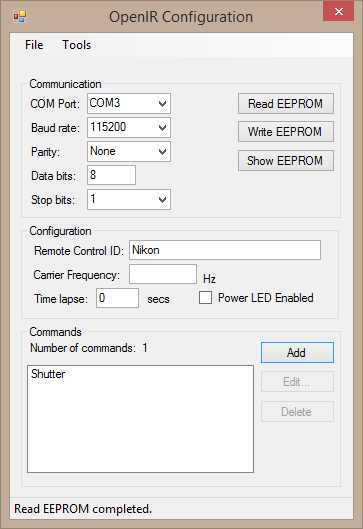 The OpenIR application can now store and retrieve the contents of the EEPROM. The previous article demonstrated how the basic IR parameters can be stored and retrieved from the STM8S EEPROM. It is now time to start to store and retrieve command / pulse sequences in the EEPROM ready for the STM8S to process. In the January design update a template for the EEPROM layout was presented. 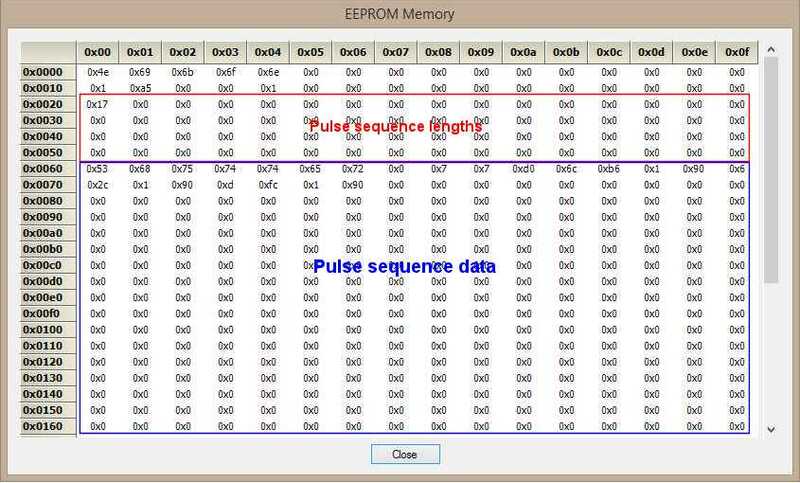 The final part of the EEPROM was the pulse sequences data. What has become apparent is that in addition to the pulse count data we should also be storing a meaningful name for the command. The names are not required by the STM8S as it can simply take a command number but they make the commands more meaningful when viewed in the Windows application. It is for this reason that we need to store the command name in the remote control. The Pulse Sequence Length table contains a list of the number of bytes in each pulse sequence. Each entry gives the offset from the start of the pulse data for each of the commands the remote control can transmit to a remote device. The pulse data table contains the information about the commands themselves. The first eight bytes contain the name of the command. The STM8S will ignore this as it is not needed in order to transmit the command to the remote device. The next byte contains the number of pulses/transitions in the command. The following pairs of bytes contain the counter values for the timer on the STM8S. The counter values determine the number of high / low sequences and their duration. One important consideration is the length of the command name. If the name is too short then the name is not meaningful to the user, too long and the number of commands is reduced and the STM8S may become unusable. Each remote control command is a series of pulses (IR signal is on) and spaces (IR signal is off). Each on /off sequence can be represented by a number of microsecond periods, the sequence starts with an on pulse and each subsequent number represents a change from on to off and so on. The above waveform is the sequence required to activate the shutter on a Nikon camera. Clicking on the Add button adds the name to the main form. The changes to the application now allow for the storing of sequences in the EEPROM. Each command is given a name which is meaningful to the user. The pulse sequences are currently stored as microsecond values. Exact counter values for Timer 2 will make the STM8S application smaller. Pulses are stored in the EEPROM s bytes but the configuration application uses ArrayLists and List objects for the command edit forms. It may be possible to provide a more elegant method for moving this data around the application. Progress on the OpenIR project has been a little slow recently, Christmas has come and gone and now a heavy workload is slowing things down further. Having said that, today has seen the project pass another milestone with a Windows configuration application communicating with the an STM8S Discovery board over a TTL serial port. This post will give an overview of the current progress. One of the goals of the OpenIR project is to create a universal remote control. To this end the project will require a configuration application. Having a number of years experience in Windows programming it made sense for the Windows platform to host the first generation of the configuration application for the remote control. 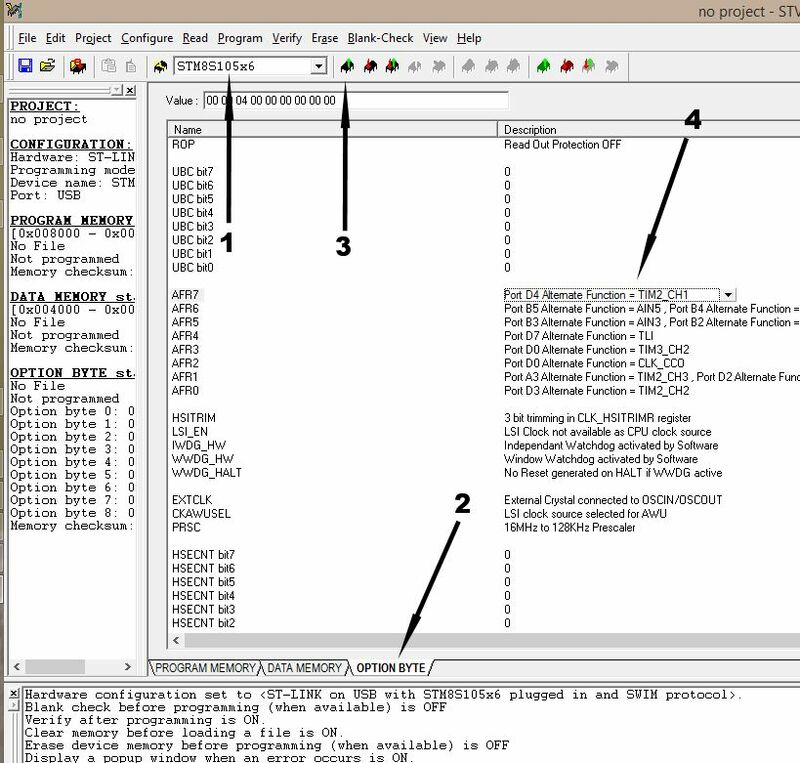 In the previous post a number of command functions were identified as being essential to this project. The main concern for the initial development is the size of the application which IAR can support on the STM8S. This is limited to 8KB and the EEPROM transfer function is likely to consume the most memory and code space. This function has been targeted first as it is likely to identify any issues early on in the software development phase of the project. The upper panel allows the user to select the COM port and the communication settings (baud rate, parity etc.). 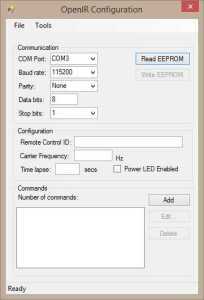 The two buttons allow the user to request the EEPROM data and write send the updated the EEPROM configuration back to the IR remote control module. 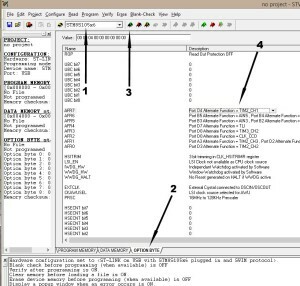 The middle section contains the controls which will show and allow the editing of the static configuration such as the name, carrier frequency etc. The lower panel contains the command list the remote control can send. More on this in a future port. 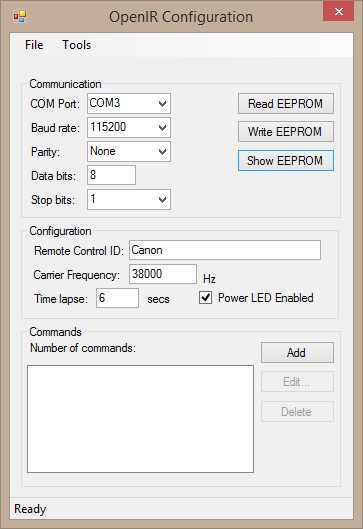 The current application allows the communication settings to be changed and implements the Read EEPROM request. 0 1 Data packet header (0xaa). 1 2 Length of the data packet (unsigned short), high byte first. 3 1 Command to be executed. 4 n Data required for this command. 4 + n 1 Checksum for the entire packet. The packet header is an arbitrary value and 0xaa has been chosen as it is an alternating sequence of bits. The initial design packet size was expected to be less than 256 bytes. As the design progressed it became apparent that is was desirable for the packets to be greater larger than 256 bytes. There are a limited number of commands which have been identified for this project. At the current time this is set to be 7 and a single byte is sufficient. The data packet is optional and in the case of the EEPROM read/write functions this will be the contents of the EEPROM either being read or written. The checksum byte is a simple exclusive OR of all of the bytes in the packet from the initial packet header through the the end of the data packet. The starting value for the checksum is 0xaa. The configuration application will first scan the PC for COM ports. Any available ports will be added to the drop down list of COM port names. Selecting a COM port will populate the fields with the default COM port configuration. Clicking on the Read EEPROM button send a request to the STM8S. The STM8S will respond with the contents of the EEPROM. This can be seen in the following traces from the logic analyser. The initial communications with the IR remote control and a PC has been successful. At this point in time the source code requires some clean up work. 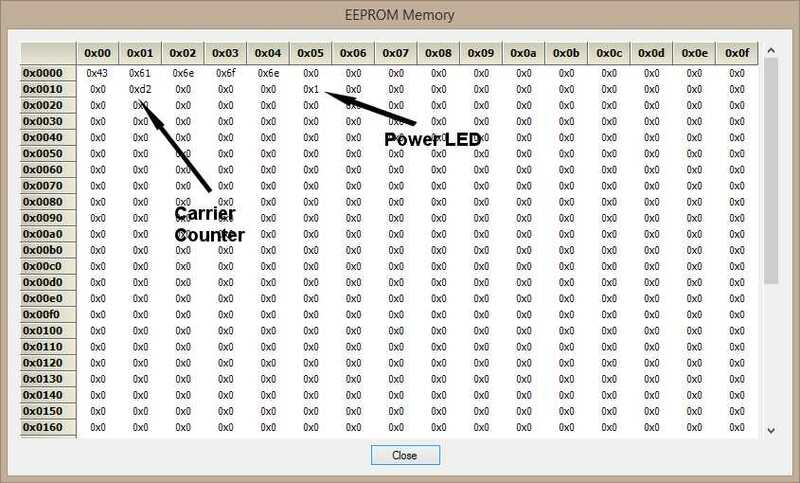 The next step is to enhance the EEPROM configuration allowing the EEPROM to be rewritten upon command from the Windows configuration application. Revision A of the board is now working and can send a single IR sequence out to a device in the real world when the on board switch is pressed. If OpenIR is to be truly universal the system needs to be able to send a multitude of commands not just a single command. In order to do this we need to be able to store IR command sequences and also allow the user to select which IR sequence is transmitted. The STM8S has been set up to connect the TTL serial port to the FTDI and RedBear BLE board ports. Doing this allows communication with the outside world (PC, iPhone etc.). The proposed solution uses the serial TTL port to send commands to the STM8S and for the STM8S to store details of the IR signals (carrier frequency, active period etc.) in the on chip EEPROM. The chip along with the chosen have a limit built into them, the fact that the free version of the IAR tools have an 8 KByte limit. This limits what can be achieved on the STM8S microcontroller. 1 Get Remote control ID. This returns a text string which identified the remote control. 2 Set the remote control ID. 3 Get the carrier frequency. 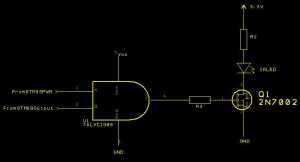 This gets the two bytes which are used by Timer 1 to determine the frequency of the PWM signal. 4 Set the carrier frequency. 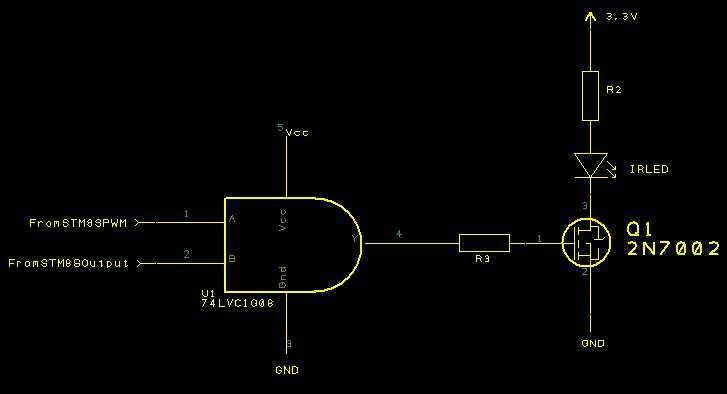 This set the two bytes which are used by Timer 1 to determine the frequency of the PWM signal. 5 Get the contents of the EEPROM pulse data store. 6 Set the contents of the EEPROM pulse data store on the STM8S. 7 Transmit pulses for sequence number x where x is the item in the payload. 8 Transmit pulses. This transmits and arbitrary sequences of pulses which are contained in the remainder of the payload. 9 Time Lapse mode. Send the pulses for sequence x after y seconds. 10 Reset the remote control. 11 Enable or disable the on board power LED. 1 Get the contents of the EEPROM pulse data store. 2 Set the contents of the EEPROM pulse data store on the STM8S. 3 Transmit pulses for sequence number x where x is the item in the payload. 4 Transmit pulses. This transmits and arbitrary sequences of pulses which are contained in the remainder of the payload. 5 Time Lapse mode. Send the pulses for sequence x after y seconds. 6 Reset the remote control. 7 Enable or disable the on board power LED. The STM8S on the EEPROM stores the configuration of the remote control. The data stored is a mixture of basic configuration along details of the pulses for each command the remote control can transmit. 0x10 2 Two bytes which are used by Timer 1 to determine the frequency of the carrier signal. The carrier signal is assumed to be 50% duty cycle. 0x12 1 Number of command sequences stored in the EEPROM. 0x13 1 Number of seconds to use for the time lapse sequence. 0x20 64 Length of the pulse sequences (0x20 = length of sequence 0, 0x21 = length of sequence 1 etc.). 0x60 512 Pulse data. It is assumed that the pulse sequences will start with an on period followed by and off period until the number of sequences have been consumed. The basic layout of the EEPROM has been determined along with a proposed command sequence. The next step is to implement the STM8S code and some sample Windows code to configure the remote control. The beep function uses the 128 KHz LSI to generate a beep signal on the beep pin of the STM8S. This post demonstrates how to use this function. The signal is output on the beep pin. On the STM8S discovery board this is an alternative function on PD4 (port D, pin 4). The beep function should now be assigned to PD4. These bits set the multiplier for the Beep Divider. Value for the prescalar divider. The documentation states that this should not be left set to the reset value (0x1f) and the value should be in the range 0 – 0x1e. Enable the beep function by setting this to 1, disable by setting this to 0. //  Initialise the Beep function. BEEP_CSR_BEEPEN = 0;    //  Turn off the beep. BEEP_CSR_BEEPSEL = 0;   //  Set beep to fls / (8 * BEEPDIV) KHz. BEEP_CSR_BEEPDIV = 0;   //  Set beep divider to 2. BEEP_CSR_BEEPEN = 1;    //  Re-enable the beep. As you can see, the output is not exactly 8KHz. The documentation states that the beep function can generate 1KHz, 2KHz and 4KHz. By changing the values of the prescalar and the selection register it appears that you can also go as low as 500Hz and as high as 32KHz.